The CAVE is a surround-screen, surround-sound, projection-based virtual reality (VR) system. The illusion of immersion is created by projecting 3D computer graphics into a 10'x10'x9' cube composed of display screens that completely surround the viewer. It is coupled with head and hand tracking systems to produce the correct stereo perspective and to isolate the position and orientation of a 3D input device. A sound system provides audio feedback. 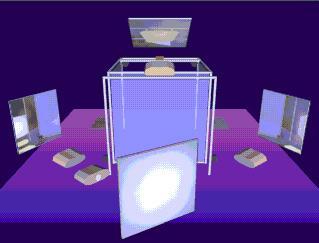 The viewer explores the virtual world by moving around inside the cube and grabbing objects with a three-button, wand-like device. Unlike users of the video-arcade type of VR system, CAVE dwellers do not wear helmets to experience VR. Instead, they put on lightweight stereo glasses and walk around inside the CAVE as they interact with virtual objects. Multiple viewers often share virtual experiences and easily carry on discussions inside the CAVE, enabling researchers to exchange discoveries and ideas. One user is the active viewer, controlling the stereo projection reference point, while the rest of the users are passive viewers. The CAVE was designed from the beginning to be a useful tool for scientific visualization; EVL's goal was to help scientists achieve discoveries faster, while matching the resolution, color and flicker-free qualities of high-end workstations. Most importantly, the CAVE can be coupled to remote data sources, supercomputers and scientific instruments via high-speed networks, a functionality that EVL, the National Center for Supercomputing Applications, and Argonne National Laboratory are jointly implementing.